I have change the theme on my sites to this one. Its what I have been looking for. Thanks. Hi, I have following problem with using this (and other themes). My top menu instead being horizontal is displayed vertical. You can see it here: http://www.neurom.pl/start . It is not the problem of the Developer theme as it happens also in eg MicroBlue theme. 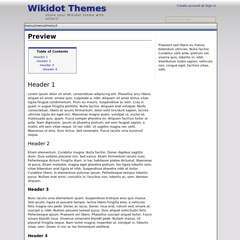 Only some basic wikidot themes work Ok (some don't). Any solution? So simple! I would never find it. Many thanks!